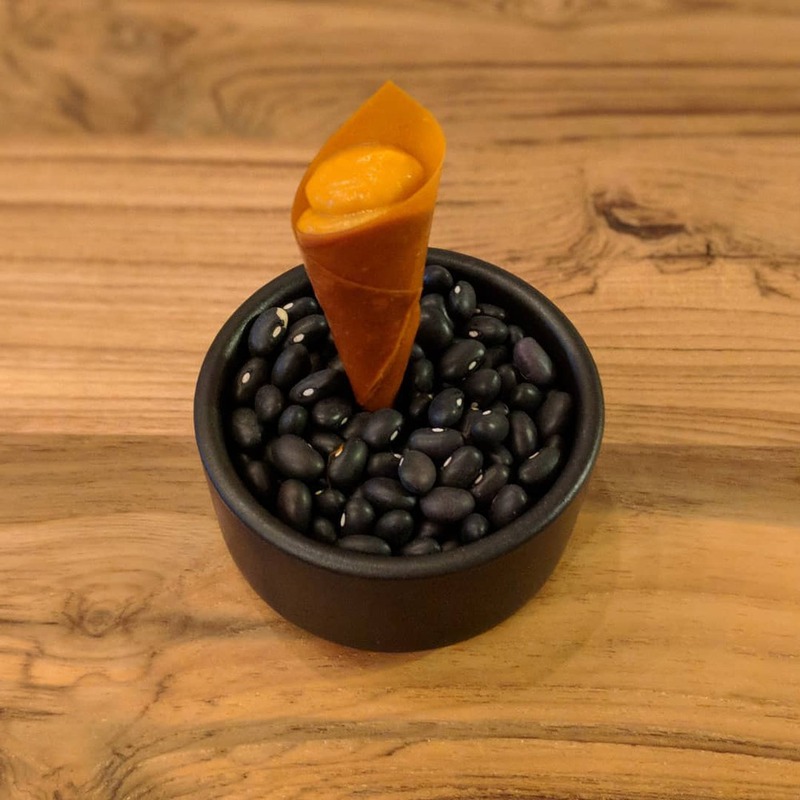 This little canapé, made entirely of carrots, is a great single bite to begin a meal, and a dish I'm extremely proud of. 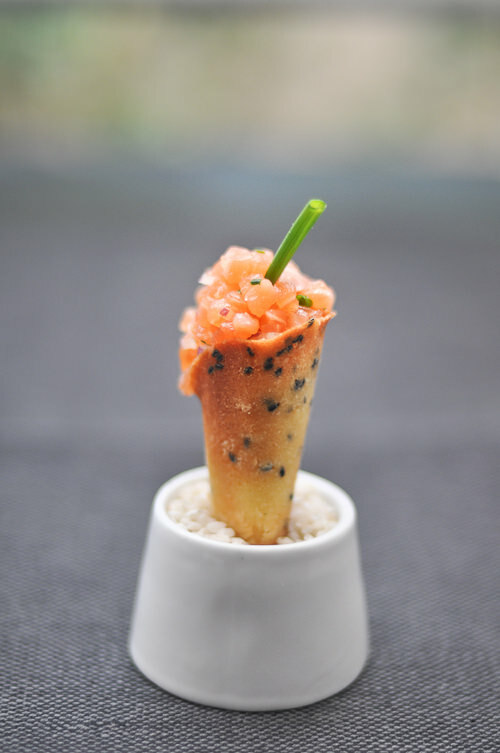 Its form is inspired by the famous dish served at the French Laundry in Napa - tiny crispy cones ("cornets") filled with salmon tartare. Besides being tasty, this dish is whimsical, highly technical, and elevates a humble vegetable to something special - all of my ideals on a plate. This is about as far into the realm of "molecular gastronomy" as I'm willing to venture; modern techniques should support a dish, not define it. We'll make an exception here. This dish is built around a technique from Modernist Cuisine in which the carrots are cooked in a pressure cooker with baking soda, which raises the pH level (making it more alkaline) which accelerates the Maillard reaction and caramelization processes, developing an incredibly rich and deep flavor in just 20 minutes. After blending, isomalt is added to the carrot mixture to aid forming a crisp shell. Isomalt is a beet sugar derivative that is both less sweet than sugar and more resistant to humidity, and is commonly used for dramatic sugar sculptures. When dehydrated with the carrot mixture it will form a crisp edible carrot sheet that forms the shell for this dish. This is a somewhat finicky dish to get right, because the shell mixture must be spread very thinly (but not too thinly) and extremely evenly for proper dehydration. Otherwise one runs the risk of the sheet tearing and cracking and not able to form any shells at all, or being too thick and wet to use. When making this recipe, plan for substantial yield loss and/or imperfect cornet shells - I make this quantity to select 4 perfect shells to serve. I don't have cornet molds and have gotten by okay without them, but feel free to adapt the recipe if you do have them. Prepare the cornet shells and filling (24h in advance): Melt the butter in a pressure cooker. Add the carrots, salt, and baking soda and saute for 1m. Seal and cook on high pressure for 20m. Depressurize with cold water. Transfer the contents of the pressure cooker to a blender and blend with the carrot juice until smooth. Weigh and set at 100%; blend in 0.1% xanthan gum. Adjust seasoning if necessary. Strain out about 100g of the puree to use as filling and reserve the rest for the cornet shells. Season the filling with cayenne, cumin, and salt to taste (or other spices, as desired); chill until needed. Weigh the puree reserved for the shells and set at 100%; blend in 10% isomalt and 2% glucose syrup. Strain. Spread the puree very thinly and evenly onto dehydrator trays lined with silicone mats (about 130g of puree for a 12"x12" area). Do not spread too thinly as it is prone to over-drying and cracking. Dehydrate for 2.5h at 140F, up to 3h if still tacky. When the sheets are pliable but no longer tacky, remove from the silicone mats by inverting onto a cutting board lined with parchment paper and carefully unrolling the mat backwards. Use a palette knife to help unstick if necessary, taking care not to puncture or crack the sheets. Trim ragged edges and cut into 2.5" squares. Form the squares into cornets; the top right corner of the square will be the point at the open end of the shell. Roll the bottom righthand corner up and towards the middle; roll into a cone from the bottom. Gently secure each cornet with a small length of butcher's twine to prevent it from unrolling. Dehydrate an additional 12h at 140F or until crispy. For optimal shapes you should rotate the cornets periodically for the first several hours, otherwise they may slightly collapse into oblong shapes (cornet molds may assist with this, if you have them). Reserve the shells in an airtight container with a silica dessicant until needed, up to 1d. To serve: Warm the filling and transfer to a piping bag. Pipe the filling into each cornet shell. Serve immediately; the warm puree will cause the shell to soften if left for too long.